The Zaza Kurds of Turkey | Roj Bash ! 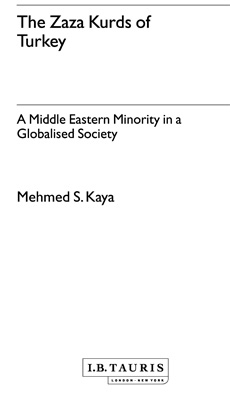 A Middle Eastern Minority in a Globalised SocietyMehmed S. KayaI.B. TaurisAlthough the world is contracting and becoming smaller as we acquire insight into an ever-increasing number of cultures, there are still many peoples with their own cultures, lifestyles and social organizations that are totally unknown to many of us. We do not know how social life in other societies manifests itself under completely different circumstances than the ones we are accustomed to. We still know little about other peoples’ living conditions, beliefs and traditions. We know little about what and how they think, what their perception of reality is, how they organize their lives, how they perceive themselves and others, how they view their and others’ actions, how they view the world, what their social manners are, how the family is organized, how kinship relations function, how they justify their actions, what in life is important for them and so forth. Mehmed S. Kaya received his Dr. polit. degree in sociology and social anthropology from the Norwegian University of Scientific and Technology (NTNU) in Trondheim. He is professor at Lillehammer University College. He founded the Norwegian Journal of Migration Research and was its editor-in-chief during the period 2000-5. Kaya has published Muslim Immigrants’ Adaptations to Norwegian Society (Dr. polit. dissertation) and a series of articles in scientific journals.